(September 23, 2003) Experience a unique and exciting Saturday. Bay Area Friends of Tibet is pleased to invite you to our celebration of our 20th Anniversary at Fort Mason in San Francisco. Discover the 3rd largest Tibetan community in the US. Our 20th Anniversary Gala, promises to be the Bay Area's premiere celebration of Tibetan art, politics, culture, and MUSIC! Opening Blessings by high Tibetan Buddhist Lamas. Enjoy the music of Chaksampa & Semshug Pundha, world-famous & Bay Area Tibetan musicians! Watch a demo of Tibetan Thangka painting by renowned Tibetan thangka painter, Jamyong Singye of San Francisco. See a preview of his soon-to-be-released feature film! Watch Berkeley-based TANC's Tibetan Children's Chorus perform traditional Tibetan song and dance! Eat delicious Tibetan food and enjoy free anniversary cake! See and purchase beautiful Tibetan arts and crafts! -- 100s of items to choose from. Watch new Tibetan movies - including award-winning Tibet: Cry of the Snowlion! 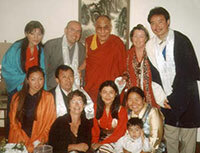 Lobby to help Free Tibet & achieve Tibetan Self-Determination. Engage yourself in a panel discussion with Arijia Rinpoche of Kumbum Monastery & local Chinese "Explorations in Tibetan-Chinese Outreach & Cooperation"
Our 20th Anniversary Gala will feature delicious Tibetan cuisine, informative lectures, slide shows, panel discussions and performances of Tibetan music and dance. Beautiful handicrafts, including jewelry, clothing, rugs, and ritual objects will be available for purchase. Participate in cultural and political events. Meet local Tibetans. Materials will be available to help lobby for Tibetan Freedom and Self-Determination. Tibetans young and old will present aspects of their beautiful and intriguing culture. At 8pm - Evening of Tibet Day. Ngawang Choephel will offer a special preview of his film, "Through the Hollow Bamboo: Tibet in Song" narrated by Richard Gere. Ngawang will sing and speak about his experiences. His film examines the causes of decay of Tibetan culture in Chinese-occupied Tibet, and documents and preserves remaining oral and cultural traditions. 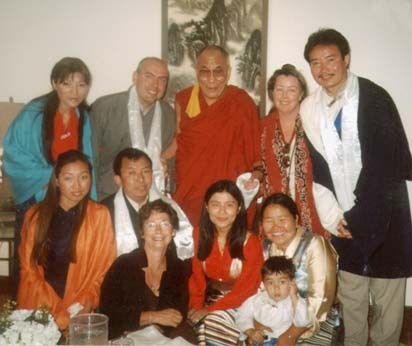 Ngawang was a Fulbright Scholar, falsely charged with espionage by the Chinese government while recording folk music in Tibet, sentenced to eighteen years, imprisoned for six and released in 2002. He is currently seeking support for his film. You can help Ngawang preserve Tibetan culture by attending this fascinating evening. Donations: $20-$100. Sponsored by the Bay Area Friends of Tibet and the Tibet Justice Center. Proceeds from the Cultural Fair will go to assist Bay Area Tibetans and others worldwide as well as to provide for ongoing support for educating the Greater Bay Area about Tibet. Proceeds from the Special Benefit Evening with Ngawang Choephel will go to support Ngawang's film project and to cover the costs associated with the event. For further information contact Diane Hume at 415-626-7195, Giovanni or Tsering Vassallo at 415-586-9267 or visit Bay Area Friends of Tibet.